A living organism (such as a bacteria, fungi or virus), too small to be seen by the naked eye but visible under the microscope. The basic approach to working with microorganisms is to regard them all as potential pathogens and to handle them with standard microbiological techniques to minimise the risk to laboratory staff and the environment. AS/NSZ 2243.3:2010 Safety in Laboratories Part 3: Microbiological safety and containment, outlines requirements for laboratories handling microorganisms. The Standard specifies different containment requirements for facilities depending on the type of microorganisms being handled. Compliance with the relevant sections of AS/NZS 2243.3 is considered as a minimum requirement for anyone handling microorganisms. The World Health Organisation (WHO) suggests each country draw up risk groups according to the microorganisms encountered within its boundaries. The following classification has been drawn up for Australia and New Zealand and is based on the pathogenicity of the agent, the mode of transmission and host range of the agent, the availability of effective preventive measures, and the availability of effective treatment. A microorganism that is unlikely to cause human, plant or animal disease. A microorganism that is unlikely to be a significant risk to laboratory workers, the community, livestock or the environment; laboratory exposures may cause infection, but effective treatment and preventive measures are available, and the risk of spread is limited. A microorganism that usually causes serious human or animal disease and may present a serious a significant risk to laboratory workers. It could present a limited to moderate risk if spread in the community or the environment, but there are usually effective preventive measures or treatment available. A microorganism that usually produces life-threatening human or animal disease, represents a significant risk to laboratory workers and may be readily transmissible from one individual to another. Effective treatment and preventive measures are not usually available. It is recommended that before starting work with any potentially infectious microorganism that you download a Pathogen SDS and use this to help you conduct a risk assessment of your work. AS/NZS 2243.3 specifies four levels of physical containment for laboratories. A Physical Containment Level 1 laboratory is suitable for work with microorganisms where the hazard levels are low, and where laboratory or facility personnel can be adequately protected by standard laboratory practice. The organisms used should generally be classified as Risk Group 1. Specimens that have been inactivated or fixed may be handled in PC1 facilities. There is no formal certification procedure required for PC1 facilities where Risk Group 1 microorganisms are handled. Facilities must comply with the requirements for the relevant type of PC1 facility as described in AS/NZS 2243.3*, i.e. A Physical Containment Level 2 laboratory is suitable for work with material likely to contain microorganisms that are classified as Risk Group 2 microorganisms. If working with specimens containing microorganisms transmissible by the respiratory route or if the work produces a significant risk to humans or the environment from the production of infectious aerosols, a biological safety cabinet must be used. It is highly recommended that you view the "Working Safely in Class II Biological Safety Cabinets DVD" produced by the Victorian Infectious Diseases Reference Laboratory (VIDRL). There is no formal certification procedure required for PC2 facilities where Risk Group 2 microorganisms are handled. Facilities must comply with the requirements for the relevant type of PC2 facility as described in AS/NZS 2243.3* i.e. PC2 Invertebrate Facilty (pg 92-95). Please note that there is a formal PC2 certification procedure for facilities undertaking certain types of gene technology work. Click here for details. 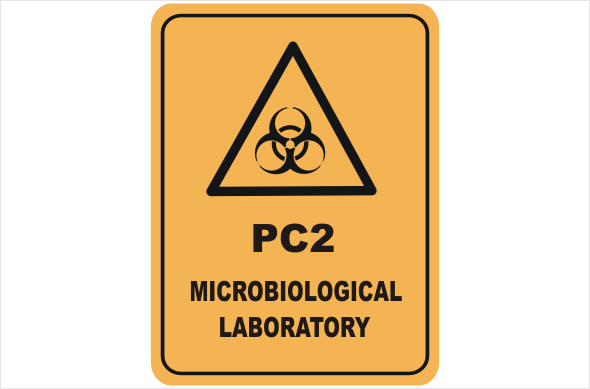 In any facility where Risk Group 2 microorganisms are handled a “PC2 Microbiological Laboratory” sign must be displayed on the entrance door to the facility. Click here for an example of suitable signage. The “PC2 Microbiological Laboratory” signage is separate from OGTR PC2 signage which designates that approved work with genetically modified organisms is undertaken in the facility. Some facilities will require both forms of signage, while some will only require one or the other. UNE has no PC3 or PC4 facilities and work with risk category 3 or 4 organisms may not be undertaken at the present time. Both infectious microorganisms and GMOs are classified into 4 levels of risk categories (risk group 1-4). The risk categories must be contained in the equivalent containment facility (physical containment 1-4). * to get access to Australian Standards please visit the UNE Library web site. Click on AT-AU, scroll down to 'Australian Standards' and click on the link. Search the database.